This summer I was at a July 4th picnic overlooking the Ohio River and the city of Wheeling. From my vantage point, one can see the Wheeling Suspension Bridge, at one point the longest suspension bridge in the world, the Capitol Music Hall, home of the once popular Wheeling Jamboree broadcast on WWVA, the Flat Iron Building, and the Stone & Thomas Building among others. Looking down at Wheeling and talking with a friend of mine, we were discussing several topics but we spent a good portion of our conservation talking about our mutual fascination with cemeteries. Perhaps a morbid topic for a picnic but we nevertheless continued. My friend described a trip he took several years ago to Buenos Aires and his visit to the La Recoleta Cemetery. I was unaware of La Recoleta, but my friend detailed the ornamental cemetery with its above ground tombs and listed some of the notable individuals buried there, including Eva Peron and several Nobel Laurites. A cursory Google search reveals the richness of the tombs and the fact that both the BBC and CNN listed it as one the most beautiful cemeteries in the world. Although I have never visited a cemetery like La Recoleta, my childhood home and my parent’s home sits right next to Greenwood Cemetery, one of the larger city cemeteries in Wheeling. Growing up next to a cemetery, I have never found them depressing, scary, or sad, but instead found them rather peaceful. Most evenings, after the grounds crew goes home for the day, I like to walk through the cemetery gazing over the names those individuals long gone and those recently departed. I look over the cemetery with its various monuments sections more as an anthropologist, observing the changes overtime and wondering what it says about our society. For the last several summers, as I have wondered through Greenwood Cemetery, I have surreptitiously taken photos of the most unique monuments and thinking about writing down my observations. My conversations this summer finally spurred me into action. According to the Ohio County Public Library, Greenwood Cemetery was incorporated in 1866 by Mayor Andrew Sweeney, Archibald W. Campbell, Dr. Eugene A. Hildreth, W. M. List, and C. H. Berry on 37.5 acres along National Road. Designed by James Gilchrist in the parklike style of the 19th century, the original acreage retains this feeling with curving roads shaded by large trees. Why the park-like style? Well 19th century America did not yet have great public parks, botanical gardens, or art museums and cemeteries provided a space individuals to walk outside and see large ornate monuments. In the 20th century, Greenwood was expanded and the cemetery grounds now include almost 100 acres. The newer parts have lost some of the park-like feel of the original section as cemeteries styles have changed, now having numerous individual stones rather than monuments. When you enter Greenwood Cemetery, you immediately see the original part of the cemetery, containing graves from the mid to late 19th century, with some 20th century markers scattered around. I find this section to be the most visually appealing because it not only contains the family plots of some of the city’s most prominent families, such as Stifel, Schenk, Wilson, Reymann, Steenrod, and Spiedel, but it also has the most unique markers. In this section, one is much more likely to find large family plots, perhaps indicating that families stayed in the region, and large obelisks mark many of these family plots. I have always found the use of the obelisk fascinating as this monument style originated in ancient Egypt and now dominates the cemetery’s original grounds. Why the popularity of the obelisk in U.S. cemeteries? In ancient Egypt, these monuments symbolized the sun god touching the Earth, and this style of monument became popular throughout ancient world. Thus, when attempting to convert pagan’s, the Catholic Church also adopted the obelisk, but added Christian symbolism. According the website, Memorials in Stone, the Obelisk became popular in the United States during the period of Egyptian revivalism in the 19th century and represented patriotism, fatherhood, and power, another indicator of male dominance during the Victorian era. Besides the obelisks, the older section contains more monument stones than any other section of the cemetery, including, angels, urns, and castle turret of the Maxwell plot. At the end, or bottom (since everything’s on a hill in WV) of the original section is the Thomas monument, the largest individual marker in Greenwood Cemetery. The marker, with its life-sized statue, marks the final resting place of Jacob C. Thomas, a relatively famous individual in the region. Thomas and his business-partner Elijah J. Stone founded the dry goods store Stone & Thomas in 1847, which eventually evolved into a department store comparable to JC Penny’s. They started the store with only a $2,200 investment and it remained in operation for just over 150 years, being bought out in 1998. Stone & Thomas expanded beyond its Wheeling store to Huntington, Charleston, Parkersburg, and most other larger WV cities. Today, the Stone & Thomas building in downtown Wheeling is home to office spaces for business, including Williams Lea. According his obituary, Thomas was a bachelor and died at his sister’s home in 1866. In his will, Thomas directed that his executor “to have placed upon the burial lot in which my body may be interred at Greenwood Cemetery near the city of Wheeling a suitable granite monument at a cost of not less than Fifteen Thousand Dollars to be first paid by him out of my estate” (more information on Thomas, including his Will and Obituary, is at http://www.jonesgenealogy.net/getperson.php?personID=I94&tree=Jones). From the Thomas monument, if one veers to the right (facing Wheeling creek), they will notice a rather unique section that consists of Greek headstones with many displaying the Greek Orthodox Cross. Growing in Wheeling, I also knew the city had a Greek population, but was surprised to find them in Greenwood. Nevertheless, I learned that a larger number of graves in this section came from Wheeling’s Peninsula Cemetery, and these individuals were moved during the construction of Interstate 70. According to the WV Cultural Center, the Peninsula Cemetery was opened in 1842 and was one of Wheeling’s largest cemeteries until interstate construction. Uphill from the Thomas monument, sits the plot of the Shriver family and the new head stone of Daniel Shriver. A Wheeling native, Shriver organized a company of men from Wheeling to serve in the Confederate Army and they became part of the 27th Infantry Regiment in the famous Stonewall Brigade. 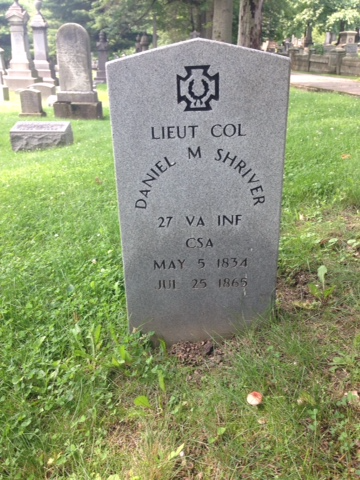 Shriver was a lieutenant during the war and died in Wheeling in 1865. I find Shriver an interesting individual as Wheeling was not only a hotbed for Republicanism during the 1860s, but was also the first capital of the state of West Virginia. Thus, Shriver’s support of the Confederacy appears to challenge larger trends; moreover, a local organization recently replaced Shriver’s headstone. 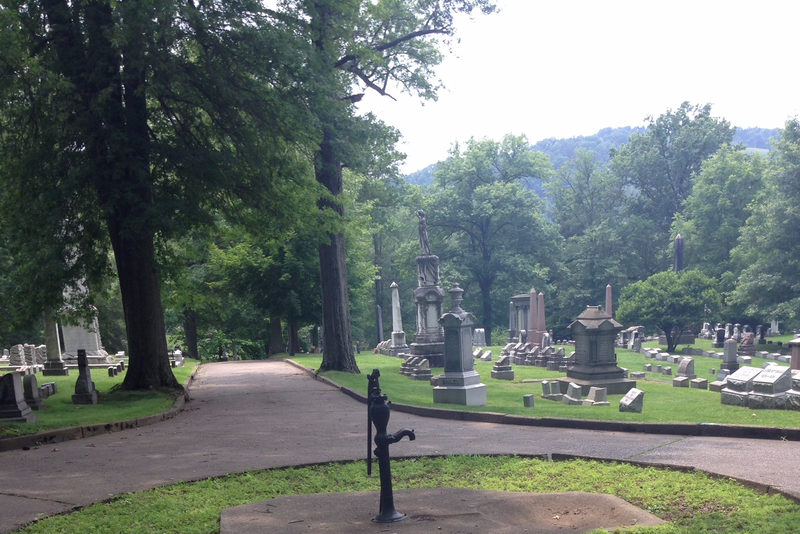 Further to the left of Shriver’s grave, if one veers to the left (facing Wheeling creek), one enters into the newer and expanded sections of the cemetery. It is here that one starts to notice the more individualized gravestones rather than the family plots of the original section. The further to the right one goes, however, the more the stones become personalized. While in older sections, some gravestones have etchings of civic organizations such as the Eagles, Lions, Shiners, and Masons, the more recent head stones are etched with sports teams, cars, song lyrics, musical instruments, etc., perhaps indicating the other directedness of American society. This is not to say that these stones lack religious themes, but there is a far greater trend to illustrate the deceased personality. Some might lament this as indication of secularization, but I would avoid this term, as the Egyptian obelisks of the 19th century are also non-Christian. These changes in headstones are for me the most interesting part of walking through the cemetery. Due to Greenwood’s age, a visitor is able to observe the changing trends not only in cemetery style and function, but also in how individuals have changed as well. One is able to observe how the things that people valued changed over time. From my perspective, Greenwood has transitioned from large family plots with unique monuments and markers to individualized headstones that mark out the deceased uniqueness. There are still numerous markers for couples, but the generational plots of the late 19th and early 20th centuries no longer exist. This is perhaps a result of Wheeling’s decline in the late 20th century or changing trends in American society. Either way, the richness of the gravestones has not decreased, simply altered from the days of Greenwood Cemetery’s opening.